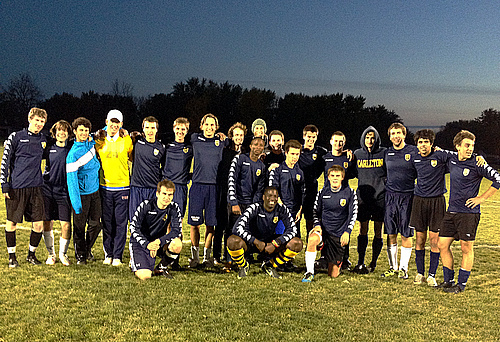 The CFC is a student-run soccer team that is fun and competitive. With regular practices and games against strong college opponents, we are the perfect fit for both new and experienced players. we have quickly emerged as one of flashiest soccer programs either side of the Cannon River. For more information about us, see our About Page. Never heard of Carleton? Change that. Want to set up a game? Visit the Contact Page. and Thursdays from 5-7pm at the Hill of Three Oaks Field. See the Calendar for games! Hello there. Welcome to the Carleton Club Soccer Webpage. End of year banquet with women's club!